Have you ever wondered what those numbers on your eyeglass prescription actually mean? Although reading an eye chart is a fairly simple test, it provides a very accurate way to measure your visual acuity or the sharpness of your vision. You'll also need a few other tests, in addition to the results of your eye chart reading, before your optometrist hands you your eyeglass prescription. Every eye exam includes a reading of the Snellen eye chart. The chart contains 11 lines of random letters, each line smaller than the preceding line. Patients were once required to stand exactly 20 feet away from the chart, but optometrists use mirrors today to approximate that distance. The chart is read from the top to the bottom. Each line corresponds to a specific measurement, such as 20/20 or 20/80. If your vision is 20/60, you can read words clearly at 20 feet that people with normal vision can read at 60 feet. Although 20/20 is considered normal vision, some people can see even better than 20/20. If you can read the bottom line of the eye chart clearly, your vision is 20/10. In addition to reading the Snellen eye chart, you may also be asked to read text on the small printed card that you'll hold in your hands. 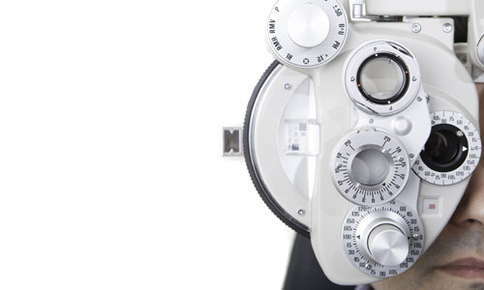 This test evaluates your near vision. Refraction. Refraction helps your optometrist refine your prescription. You'll place your head against a phoropter, a device that contains multiple corrective lenses. While you look at a line on an eye chart, your optometrist will flip back and forth between two lenses and ask you to identify which lens provides the clearest image. Autorefraction. Before your refraction, your optometrist or his staff may ask you to look into an autorefractor, a machine that does a very good job of estimating the prescription you'll need. Cover Test. During this test, you'll cover one eye at a time and stare at a fixed point in the distance, then look at a near object. The test evaluates the ability of your eyes to work together to produce a single image. If you must move your eye in order to focus, you may have strabismus. Although the condition is commonly called "crossed eyes," it can still be an issue even if your eyes are only slightly misaligned. Strabismus is often detected during childhood and can be corrected with special eyeglasses, prism lenses, vision therapy or surgery if other treatment options aren't helpful. Ocular Motility Test. The ocular motility test is a simple evaluation that assesses your ability to follow moving objects with your eyes. While you hold your head still, you'll use your eyes to follow a small beam of light that your optometrist moves in various directions. Glaucoma Test. Glaucoma, a condition that occurs when the pressure inside your eyes rises to dangerous levels, can damage your optic nerve, resulting in vision loss. The test takes seconds and involves exposing each eye to a puff of air. Color Blindness Test. Optometrists typically use the Ishihara Color Vision Test to determine if you can see colors normally. During the test, you'll look at a series of circles made up of colored dots. Each circle also contains a number in a lighter color. As you're shown the circles, you'll be asked to call out the numbers. If you can't see certain numbers, you may have color blindness. Depth Perception Test: Eye exams also include a test of your depth perception. After you put on a pair of 3D glasses, you'll view a test booklet that contains several pages, each containing four circles. If your depth perception is normal, one of the circles will look as if it's closer to you than the others. Slit Lamp Test. The slit lamp test takes advantage of the magnifying powers of a microscope to allow a thorough look at the individual structures that make up your eye. After you place your chin and forehead against the instrument, your optometrist will examine your corneas, whites of your eyes, eyelids, and irises. Your retinas can also be examined if dilating drops are used. Is it time for your annual eye exam? Call us today to schedule your appointment. American Optometric Association: Visual Acuity: What is 20/20 Vision?